If you are interested in the phases of the moon, the StarMessage screensaver can be a convenient reminder for you. It shows you the current moon phase inside a realistic presentation of the night sky and warns you about the upcoming full moon. The screensaver starts whenever you do not use your computer and instantly shows you the current moon phase. This is an effortless way to stay in touch with the moon phases; you do not need to visit a website or have an online internet connection to see how the moon will be tonight. This is what makes this screensaver an excellent companion or replacement of a usual moon phase calendar. The screensaver also adds a romantic scent in your daily life as you can leave a series of love quotes and the stars of the night sky will move around to write your messages. If you are lucky and fast enough you might see a falling star and make a wish on it. The screensaver has also a handpicked list of famous quotes, so you can turn them on, and read quotes of wisdom, love and peace on your screen every time the screensaver starts. No credit cards required, no forms to fill in. The program is completely free of any 3rd party advertising modules. Installation and removal is easily done in less than 1 minute of your time. Enjoy this different moon phases screensaver and let it bring beautiful emotions in your heart. If you are interested in the phases of the moon, the StarMessage screensaver can be a nice reminder of them. As the screensaver starts when you do not use your computer, this is an effortless way to stay in touch with the moon phases; you do not need to visit a website or have an internet connection to see how the moon will be tonight. The screensaver also adds a romantic scent in your daily life as you can leave a series of romantic messages and the stars of the night sky will move to write your messages. Installation and removal is a 1-minute easy task. Windows will switch off your monitor after 15 minutes and you will have the screensaver running for 10 minutes. We can send you a new activation code. I found a problem with the screensaver. How can I get help to fix it? In the battle of humans against the machines, sometimes the machines win. The program might have a bug and we will have to fight against it. A screensaver is a small software application that is automatically activated when you leave your computer unattended without any keyboard of mouse activity, for 5 or more minutes. The first screensavers were build about 20 years ago to save the phosphor of the monitor screen, from being exposed to the electron rays when the users forgot the computer On. 1) Find the screensaver on the internet. 2) Download the screensaver to your computer install it. 3) Set the idle time (optional), after which, the screensaver will start automatically. Can this screensaver do something really useful? Yes! It can do almost anything you want. Just wait to see a falling star, and make a wish on it. But be careful to WISH ONLY FOR GOOD things; you cannot make your life better by wishing for bad things. I registered the program but after some years says it is unregistered. How can I pay for StarMessage? What are the payment options? You can pay with credit card online/via phone/via fax, paypal, cheque. Payments are processed directly by RegNow an industry leader in software payments. You will be billed by RegNow. Please note that we have no access to your credit card details. All this information is treated by RegNow. You don't need any of them and you can safely remove them from the shopping cart. We will provide you the download location for the screensaver. Where am I supposed to type the activation code? This will bring up the configuration screen. Press the button named [Enter Registration Code]. If such a button does not exist on the main configuration screen, check if the program is already registered (see above). If you are using a special edition of the screensaver, download the free trial and then activate it. How do I know if the screensaver is registered or not? - "Please register" reminders appear occasionally. - The title bar of the settings dialog says "trial version". - The title bar of the settings dialog says "registered". 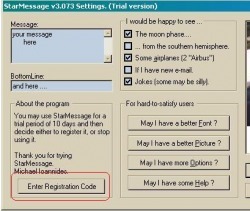 - The settings dialog says "Thank you for buying StarMessage". Where do I find the famous quotes? [Quotes], and by using the next button select a category of quotes. Every category of quotes has a different image. In almost every category there are a lot of famous quotes, but most of them are in the “wise guy” and the “peace” categories. Make sure that the “composed by the program” option is turned ON. How do I hide the bottomline and the full moon notifications? Make sure the bottomline is empty of any characters. How do I adjust the duration of the message in the stars? You can keep the assembled message longer in the sky by typing a long bottom-line with lots of spaces inside it. How do I display a "&" character in the message? To display the '&' character in the messages, type two of them together ('&&'). How do I select the default screensaver and when it should appear? and select the "wait" time. A typical value is 5 minutes.